The asphalt pavement, overcrowded tenement blocks and looming towers of Manhattan must have felt like a prison to New Yorkers in the scorching summer of 1896. After a spell of fairly clement weather in the first days of August, temperatures in the 90s suddenly settled upon the city, accompanied by high humidity and nighttime heat that never dropped below the 70s. Over ten consecutive days, from August 4 to 14, one of the worst urban heat wave disasters in American history unfolded. By the end of the crisis, the city’s fever had slain 1,500 people, more than the New York City draft riots of 1863 or the Great Chicago Fire of 1871. Heat waves are a unique natural disaster. They kill slowly, and silently slink away without leaving any trail of infrastructural damage. Additionally, because heat waves were not recognized as a public health threat in the late nineteenth century, the event left little trace. If not for death certificates and a few vivid letters sent by New Yorkers to relatives and friends, it may have been lost from the annals forever. On August 4th, the heat wave claimed its first victim, a 15-month-old Russian named Hyman Goldman. Goldman had immigrated to America with his family only nine months earlier, and had already been diagnosed with cholera infantum when the heat struck. The fatal disease, common in the 19th century during the summer months, should have been the doctor’s first instinct in identifying the boy’s cause of death. Instead, he noted another cause in Goldman’s death certificate: “exhaustion” (from the heat). 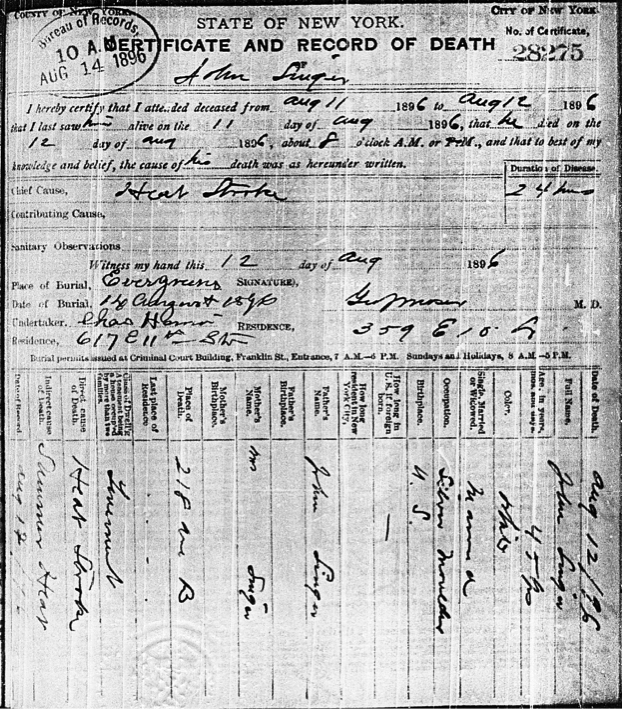 Such death certificates contain a trove of material about how people lived—and, of course, died. Of their multitude of details, some of the most remarkable include the victim’s country of origin (if foreign), class of dwelling, primary and secondary causes of death, and sanitary conditions. Study of these certificates has shown that the casualties of the heat wave were typically poor and residents of the city’s overrun tenements—more likely than not, victims were immigrant laborers of the Lower East Side. These were the thousands of people crammed into unsanitary dwellings that had little air circulation and no tap water. Families of five or six shared a single room. When there was extra space on the floor, it was often rented out to single men—most of whom were laborers who worked six days a week under the searing hot sun. A week after Goldman’s death, the heat peaked. The high was recorded as 94 degrees, but because official temperatures were taken at an elevation above street level, the heat at ground level was likely 120 degrees. “The days of death continue,” wrote The New York Times. “The sun is still unwearied of scourging.” August 11 took the lives of 350 people in Manhattan and Brooklyn; hospitals admitted another 300 people. Additional deaths resulted from a city ban on sleeping in public parks. Instead, people took to their tenement roofs, and some fell several stories to their deaths. Others snuck down to doze by the piers, and in their sleep rolled into the river and drowned. Dead horses piled on the roads; one reporter testified that during a short walk he counted more than a dozen dead horses, and at least one on every block. On August 14, the heat finally broke. Temperatures calmed to 80 degrees, and at night, fell to 70 for the first time in ten days. Life in Manhattan slowly returned to normal, but the city had learned its lesson. By 1919, public officials had already instituted “ice stations” for the poor, the early version of modern day cooling centers. Today, it is still impossible to pin down a universal definition for heat waves; this changes by region. According to the World Meteorological Organization, heat waves occur when the daytime maximum temperatures are greater than 9 °F above average for at least five consecutive days. They happen when a blocking pattern coincides with a high-pressure system during the summer months, limiting precipitation and cloud cover due to subsidence (or sinking air). This allows temperatures to soar from the lack of cloud cover, and the temperature of air to increase as it is compressed by greater pressure on the surface of the earth compared to the atmosphere. This piece was inspired by Edward Kohn’s “Hot Time in the Old Town” (2010), which chronicles the lethal 10-day heat wave of New York in 1896.